Before the Civil War, Gettysburg was best known for orchards of delicious fruit, but one Gettysburg peach orchard became a hot spot during the battle in 1863. The peach orchard at the intersection of Wheatfield Road and Emmitsburg Road became the scene for a confrontation between Longsteet’s Confederate troops and Sickles’ Union troops. It was the scene of intense fighting on July 2, 1863 from approximately 4pm to 6:30pm when Longstreet ordered the Confederate infantry assault. Sickles ordered the men in his Union line to advance forward from Devil’s Den to this Gettysburg peach orchard because it was on slightly higher ground, but it created a bulge that exposed them to artillery fire on two sides. The lead defender was Union Brigadier General Charles K. Graham of the Third Army Corps. There were also nine Union artillery batteries in the immediate vicinity plus other long-range support from Cemetery Ridge and other elevations. They defended the orchard against the attacks of Confederate Colonel Edward P. Alexander and Colonel Henry Coalter Cabell’s artilleries. At 6:30pm, Longstreet’s Corps ended the artillery duel and began the assault with a tremendous Rebel yell. Confederate Brigadier General William Barksdale advanced with his Mississippi brigade of 1,600 men, and on his right side, Brigadier General William Tatum Wofford led his Georgia brigade of 1,300 men. However, the 57th Pennsylvania and 114th Pennsylvania of Graham’s brigade rushed across Emmitsburg Road before the Confederates reached it. They tried to gain a hold around farmer Joseph Sherfy’s house, owner of the orchard, but there were many casualties and Confederates soon crossed the Peach Orchard. As the Union line was broken, Confederates knocked General Graham off his horse and captured him as a prisoner. The “Excelsior Brigade” of New York regiments were positioned in the orchard and along the road. The 73rd New York Infantry (the Second Fire Zouaves, a regiment of New York City volunteer firemen) also entered into the battle to fill a sudden gap in the Union line. They faced Barksdale’s soldiers from the 13th Mississippi in an area of the orchard now known as “Excelsior Field”. Sadly, several wounded Union soldiers who took refuge in Sherfy’s barn burned to death after it was set on fire by the gunfire. Union General A.A. Humphreys and his division along Emmitsburg Road bought time for the retreat so the Union artillery could escape and reform on Cemetery Ridge. 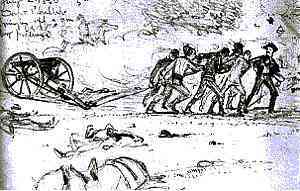 The 5th Massachusetts Battery had already lost so many horses that cannons had to be pulled away by man power, as seen in this eyewitness sketch from the National Archives by Charles Reed. It shows Captain Charles Phillips and gunners of the 5th Massachusetts Battery dragging a gun by the Trostle Barn as Confederates from the 21st Mississippi pursue them. Farmer Sherfy salvaged as many of the damaged orchard trees as he could and planted new tress to replace those that died. He continued to sell canned peaches from his orchard as he had before it was touched by war, but he added an advertisement that they were from his original peach trees on the battleground! Today, the Gettysburg peach orchard has been replanted and is maintained as a recreated battlefield site. What do they do with the peaches now? The restored trees are ornamental, so no fruit is produced. If you are looking for some fresh, local peaches, try the farmers markets and modern Gettysburg peach orchards in late July and August.